Banner-toting airplanes, though sometimes loud, are usually not heavy on commentary; they are better known as a flashy way to propose marriage or promote happy hour at a local bar. And protests, more often than not, take to the streets rather than to the skies. Recently, however, the two have converged. Starting in December and continuing through last week, five banners blaring criticism of the mayor and support for police officers have been towed over the Hudson River. That followed several banners sent airborne over New Jersey by New York Jets fans pleading with the team’s owner to fire John Idzik, the team’s general manager. In an era of microtargeted digital ads that can reach millions of carefully chosen eyeballs, the idea of paying a gas-guzzling aircraft to tow a few words for a short window of time might seem antiquated. But those who have recently done it said it was a way to send a conspicuous message that drew widespread news coverage. It was also relatively inexpensive, especially when multiple people shared the cost, as was the case with both sets of banners. A group of retired police officers, calling themselves Retired N.Y.P.D. for a Safe New York, have claimed responsibility for the last three of the anti-de Blasio banners. Their leader, who identified himself only as Captain Dave, said he was an officer for 21 years. He requested anonymity for privacy reasons, he said, not because he feared retaliation from the mayor’s office. Those two banners followed the killings of two police officers in Brooklyn on Dec. 20. Many officers, faulting the mayor for what they felt was his critical view of the police, turned their backs as they stood outside the funeral homes during the mayor’s eulogies for each officer. One banner was sponsored by a retired Westchester County corrections officer, Michael Sheehan. The sponsor of the other banner has not been publicly identified. The mayor’s office did not respond to requests for comment about the banners. A Jan. 15 poll, however, suggested that voters were largely on the mayor’s side in his rift with the police, with 67 percent disapproving of the back-turning incidents, and 52 percent saying that police discipline had broken down. The police group paid for its banners through online fund-raising among its members. A single banner cost $1,000 for a 2 1/2-hour ride over the Hudson River. All of the anti-mayor and anti-Idzik banners were flown by Jersey Shore Aerial Advertising, out of the Central Jersey Regional Airport in Hillsborough, N.J. The owner, Ashley Chalmers, said most of his work came from Memorial Day to Labor Day, and he mostly flew over beaches on Long Island and in New Jersey. Mr. Chalmers, who flies an American Champion Citabria (“Airbatic” backward), said he did not usually carry political messages, or wade into social or athletic controversies. “But sometimes I do get calls around Election Day, for banners that say, ‘Vote for this guy or that guy,’ ” he said. Mr. Chalmers said he did not like to take sides. “I’m just the messenger,” he said. Banners, typically made with five-foot-high letters, attach to planes with a deft bit of aviation and a few interconnected mechanisms. Planes typically do not take off with the banners attached, because the letters could be damaged or caught in a snare. Instead, the planes grab the signs midflight. As the plane approaches the ground at around 80 miles an hour, the pilot passes above two five-foot-high poles that hold a rope the banner is attached to. A hook that is tethered to the plane snares the rope, and then the whole message trails the plane as it ascends back into the sky. Flying a plane up the Hudson River poses some challenges, because the skies over Manhattan are restricted airspace. So are large stadiums during major sporting events like football games, because of a federal rule enacted after the attacks on Sept. 11, 2001. The banners were paid for by two different Idzik groups, which eventually pooled their resources. Jason Koeppel, of Hackensack, N.J., a founder of one of the groups, said that members of the other group flew a banner in the late 1980s to get Joe Walton, head coach of the Jets, fired. Mr. Idzik and the team’s head coach, Rex Ryan, were fired on Dec. 29 after the Jets finished in last place in their division, so Mr. Koeppel said they did not have any more flights planned. “I think we were successful,” he said. As for Captain Dave, while he said he did not expect Mr. de Blasio to resign, he would like to see him apologize to the Police Department. An article on Monday about the recent use of aerial banners to broadcast criticism over the New York region referred incorrectly to the sponsorship of a message demanding that Mayor Bill de Blasio apologize to the New York police. He is Michael Sheehan, a retired Westchester County corrections officer; it is not the case that the sponsor’s identity remained undisclosed. Because of an editing error, a picture caption also misidentified that banner’s sponsor as Retired N.Y.P.D. for a Safe New York. And because of an editing error, a picture caption in some editions described incorrectly Ashley Chalmers, the owner of an aerial advertising business. The photograph, of Mr. Chalmers standing by his plane, showed him displaying a banner with a message for the mayor, not preparing to fly it. The time of Wednesday’s flyover, with the media watching practice and Idzik, Ryan and Johnson all on the field, was planned specifically, the owner of Jersey Shore Aerial Advertising told The News. A plane carrying a ‘Fire John Idzik’ banner flies over Jets practice Wednesday. Look! Up in the sky! It’s a bird . . . it’s a plane . . . it’s an angry Jets fan. Jets fans’ hatred for GM John Idzik reached new heights — literally — Wednesday when an aircraft towing a banner saying “FIRE JOHN IDZIK” flew over the team’s practice field for all the Jets — including Idzik, Rex Ryan and owner Woody Johnson — to see. The plane circled the facility for about 20 minutes, all of which was during the media’s half-hour window to watch practice. At one point, the Jet triumvirate laughed together, but after practice Ryan and a few players were not in a joking mood. “I don’t think it’s appropriate,” said Ryan, adding he thought it’s unfair to pin this awful 1-8 season on one person. If they still want to mention it to the GM, the Jets will likely get another chance Sunday. Ashley Chalmers, owner of Jersey Shore Aerial Advertising, the company that flew the banner, said he “believes it will be” in the sky over MetLife Stadium during the Steelers game. The Jets are 1-8, losers of eight straight, and both Rex Ryan and John Idzik could be out the door after this dreadful season. So were Jet players, who said the plane became a distraction as they prepared for their Sunday game with Pittsburgh. At least they have a new excuse ready to go. Jets head coach Rex Ryan, GM John Idzik and owner Woody Johnson laugh as a plane with a banner reading ‘FIRE JOHN IDZIK’ flies overhead. Vick called the banner “a bit extreme,” and suggested the money spent on it could have been given to charity instead. “It’s just like kicking a man while he’s down,” the quarterback said. The timing of the plane was impeccable: Not only did it arrive while the team was at practice, but it was also during the period when all the media would be outside to see it. Chalmers confirmed that the timing was not a coincidence — it was the time the customers requested — but said he wasn’t sure how they got their information. 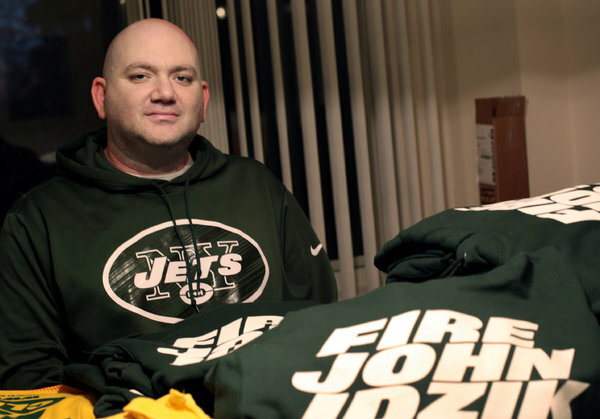 The ‘Fire John Idzik’ banner is paid for by ‘frustrated’ lifelong Jets fans. The mystery fans who sent a plane to Florham Park are only a few of many bothered by the team’s general manager. Fans running the website FireJohnIdzik.com have raised more than $10,000 through crowd funding and say they are scheduled to put up three billboards — one static and two digital and rotating — near MetLife Stadium later this month. They claimed Wednesday they were not responsible for the plane. And that’s the plane truth. © 2015 FlySkyAds.com All Rights Reserved.